An Active 55+ Adult Apartment Complex, Bistro Restaurant & Fitness Center on 141 & Bell Rd is being petitioned. 170 units on a 6 acre Lot (25 Units per Acre). The tenants are described to be “very active” and the 5 story complex will not offer any level of care or meals etc. A variety of 1,2 & 3 Bedroom apartments will be available. A Parking Garage is proposed for the frontage along 141. The developer indicated 275 parking spots, the minimum allowed. Zoning variances will be necessary to fit everything in the space available. 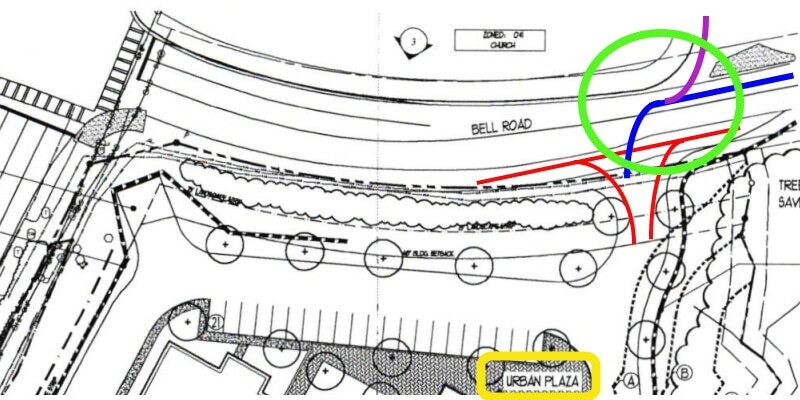 Johns Creek United Methodist Church (JCUMC) Preschool carpool is diagonally across from the proposed apartment complex’s only entrance & exit, requiring police presence twice a day. Hundreds of cars leave from JCUMC and from the Presbyterian Preschool across the road, mixing in with regular Bell Rd traffic, making for a dangerous intersection requiring police to manage traffic control. Johns Creek United Methodist Preschool pays the City for the Police Officers to manage traffic control twice a day. Developer Traffic Count Study indicates 849 Daily trips from the Apartments. The only road improvement indicated in the submitted plans is a turn lane area to enter & exit the complex (in Red). This area Circled in Green will become more dysfunctional as Cars seeking to turn left (blue) into the apartment complex will block the cars exiting the Church (purple). Highlighted in yellow is the Urban Plaza, where Bistro Restaurant and Fitness Center is proposed. City Council Hearing Nov 16th. This will be the first meeting with newly elected council of Post 2 & 5 (stipulation of no run-off). The owner of this property, Mr. Wages, has given Post 2 candidate, Todd Burkhalter, a campaign contribution of $750. This is a commercial C-1 property being turned into a residential use. The Mayor and city council say we are deficient in commercial and that we need to protect our commercial space for the revenue it provides. Traffic is the number 1 issue in Johns Creek. Yet here we are adding another high density project that will make traffic worse without a solution to our current traffic issues. The number of daily trips to be added on Bell Road is likely to be more than 10% of the current traffic load, which is a significant increase. Traffic on 141 North and South will need to be stopped longer to allow for this additional traffic load. The stretch of 141 from Skyway Drive to Johns Creek Parkway is Ground Zero for High Density Housing in Johns Creek. If approved, this project will make the densest area just even denser. I posted earlier for Patty Hansen on this very topic. If you could answer the questions I asked of her on this issue, it would be much appreciated, especially with both of you running for the two month term. I realize you have answered part of my questions. Can you address the other issues? No, it is not the responsibility of Johns Creek to make the market advantageous to certain developers. Plus, granting variances in one case but not another would be demonstrative of picking winners and losers and, potentially, making the city liable in lawsuits. If we did not abide by the rezoning process set forth in the charter, then that would make all zoning decisions capricious or whimsical. I oppose high density housing developments. A vote for Radford post #6 is a NO vote for high density housing. Existing City Council members are a bunch of hypocrites when they speak of improving traffic congestion in Johns Creek and then speak out of the other side of their mouths by lobby for and approving more high density living complexes. They should all be voted out including the mayor. Another adult community for non-working baby boomers! Didn’t the Mayor say that we needed to attract millenials in order to attract business? Where’s the housing for young people? @Reinecke – This mayor talks out of both sides of his mouth. One day it’s about millenials. The next day it’s ‘active seniors’. Two opposite sides of the spectrum. He told me personally that he liked roundabouts because they would lessen traffic on the roads upon which they were built. This was a couple of years ago when I asked him about the one that ended up on Sargent. I was curious… He said it will “encourage drivers to use another route.” Oh boy, What a great idea. Really? So now we are putting them all over the place. What roads do you think the mayor would like us to use??? The roundabouts on Bell Road do not discourage traffic as they are currently set up. What happens is they slow traffic down and create a huge noise issue for the neighborhoods next to them. To make things worse, construction traffic which travels the length of Bell Rd (not via 141/Medlock) for this project is a big part of this mix. Those trucks are coming 10x/hour and use their air brakes which should not be allowed in residential areas. Unfortunately, there is no rule preventing this at the moment. The roundabouts also slow down drivers who are playing their music loud and drivers who are driving cars with loud exhaust systems and engines. They treat the speed back up part like a drag strip. Maybe roundabouts are good, but they should be paired with noise barriers around them and some enforcement or rules. @Coughlin – If you were sitting on council what would your vote be on this one? This mayor and current (and past) council has screwed up Johns Creek so bad it’s hardly recognizable. If we don’t get council officials that stand up for preserving the quality of life for JC residents LIVING IN JOHNS CREEK NOW, this city is doomed. This mayor, supported by a council of yes men/women for years now, can tout some accomplishments of course; but the collective monumental failures, ineptness and incompetence far outweigh any accomplishments. This kind of rezoning request should not be permitted. Period. It’s no different than putting 170 houses on 6 acres. That corner is already a mess! Why does something as ludicrous as this even make it this far along in the process- wasting time and money, let alone riling up the residents. Where you say above rezoning “may only be justified if it (has) a substantial relation to the public health, safety, morality or general welfare.” Wouldn’t this clearly would be unlawful? This development, if approved, will impact safety, and general welfare. It already takes 1hr at commute hour to travel 10 miles. I use this route every day. I know. It’s getting worse and worse all the time. That corner is already a HUGE mess. As for public health, I would have to say if this development is approved it will negatively impact the mental health of the already pushed to the limit drivers now driving in Johns Creek. There are already so many irate drivers due to the severe traffic issues we must face every day. People are pissed off, and it’s making them nuts. Seriously. I see it every day. Tailgating, flipping people off, yelling at drivers, using the shoulder to make a turn or pass, illegal U-turns, running red lights because they are not synced properly… The list goes on. I wish we were still just Fulton County. The incorporation of Johns Creek with its $92 permit fee just to replace a HOT WATER HEATER has been the biggest mistake we made as North Fulton voters. We didn’t move to this area so we could live among a “District”!!! No growth policy only. A vote for incumbents on this City Council is just a vote for more traffic out there on 141. Take the present tax revenue and use it more productively. Cut some jobs on what is becoming a bloated bureaucratic payroll. We don’t need more revenue from commercial development ; we need more responsible spending and use of the same revenue stream that gave us reasonable levels of municipal services as Fulton County. Less development, less MIPs, less ridiculous moving and non-moving traffic violations citations( tickets in the Publix parking lots etc), and less ridiculous permit fees to make routine home repairs. Leaving Johns Creek as soon as my house sales. Area is getting to congested, traffic is too bad!!! Building a bunch of nothing in what I thought would be a quaint area. Johns Creek is the WORST! One more note: I have to say when Mr. Wages wanted to build the funeral home and our residents were against it, we as a HOA made our case and he listened to not build a funeral home right there. Perhaps Mr. Wages understood that with so much opposition to the funeral home it would impact the viability and success of his funeral home and the land would have to be used for something else that wouldn’t be dependent day to day on patronage from the local community… like housing. With the grants we’ve been consuming, aren’t we on the hook to put more high density or low income housing in JC? Mayor Bodker accepted campaign contributions from the land owner Deen Day Sanders. After the 600+ homes rezoning was approved, she sold the land to developers to build. We need to set a precedent that incumbents, current candidates, and future candidates don’t require contributions to win these local elections. I’ve got my message out on less than 2 grand. My motives are clear that I want to be a good steward of every taxpayer dollar. Contributions can only cloud motives and I think we, as a community, can ask that we (future candidates) set a pact of refusing contributions and running a campaign on a limited budget. With technology these days, you can find out a person’s platform without them spending an obscene amount of money. Needless to say, I’m probably not liked by political consultants and marketing vendors with these beliefs. @ Chris Coughlin You got my vote. I am tired of politics as usual. Wouldn’t this be illegal? This is a pay off. Right? I invite the Johns Creek mayor and city council members to personally drive in their own vehicles up and down 141 between 8-10AM, noon-1PM and 5-7PM and after a couple of weeks see if they still want to add to the housing density of the City. They might also try McGinnis from 141 to Peachtree Industrial between 5-7PM. I’ve got news for this group…more is NOT better. The impact of the increased traffic fails to take into consideration the pending increase in traffic once the new development on Bell Road begins filling in. This increase in traffic will be significant and has not been addressed, except for the traffic circle at Bell and Boles road which effectiveness remains to be seen. When I moved to this area ten years ago, i thought this was an ideal place with trees and land. Now I see nothing but congestion with traffic and more and more buildings going up. It appears we cannot leave well enough alone.One can’t enjoy scenery for buildings and traffic. Good luck with the future of Johns creek. Perhaps the mayor has given up on the idea of bringing more business to Johns Creek and is settling for housing the retirees from the many companies that are locating in Alpharetta. As a resident of JC, a homeowner at Foxdale, who loves our schools but cannot stand the daily commute to Midtown for work, I have completely lost faith in our elected officials. After the Bellemoore was approved, (and it is laughable to this day how many of them said that only every 4 or 5 houses will have kids, as if a young family moves to JC for any other reason but good schools) and without a doubt there were some significant contributions made and connections worked for an atrocity of that size to be build on Bell Rd, it is obvious that the JC officials we started with years ago are not the same people that are running the show now. Different value system. Sadly, they’re not playing a part in that show. It is us, the residents, that have to deal with traffic on that crazy corner of 141 and Bell, the overcrowding of schools, and that traffic mess ‘salvation on Bell, the roundabout. The reason the funeral home owner listened to us was because he was a person who has not lost himself in money, power, and favors. So, the choice is really simple: either we accept the fact that our JC gov’t could care less or we do something about it. It’s not much of a choice for me. Extra housing will add hours to my overall commute, time that I could be spending with my children. I have values, and they’re not monetary. The sitting council and mayor have proven time and time again they are incompetent as well as clueless when it comes to preserving quality of life for the residents of JC. Hopefully the voters won’t be as stupid on this Nov 3rd election as they were during the last election. Perhaps, instead they will vote in candidates with minds of their own, and ethics, and folks that truly care about Johns Creek citizens. if the right people are elected I am hopeful and fairly confident the new council will not allow King Bodker to implement HIS OWN AGENDA completely unopposed. Bodkers egotistical objective has been and continues to be to turn JC into a Buckhead. He told me this personally some years back when as a I concerned citizen I went to city hall to meet with him. I went to see him to find out what was happening my city. During that same conversation I told him this was not why I (and many others) moved to JC twenty years ago. He told me I should probably think about moving. Guess that pretty much reveals the character of the man. Don’t we have any men with a backbone? Or do they all kowtow to Bodker?